While working on an offboarding script, one of the requirements was to send an e-mail to the manager with the OneDrive for Business URL of the user that was going to get disabled. There is quite some information on the internet on how to get this with CSOM, but not a lot in how to get it with PowerShell for IT Pros like me … we prefer PowerShell cmdlets to code! While this is not available in the default SharePoint Online Module ,we can use the PnP PowerShell cmdlets to do it! The first thing you must do is to get your credential and use the Connect-PnPOnline cmdlet to connect to your SharePoint Online Admin Center! You can then run the Get-PnPUserProfileProperty cmdlet to get the information about the user’s profile and select only the PersonalUrl which is the URL of that user’s OneDrive for Business! That’s it! Once you know the right cmdlets to use, it’s that simple! In this blog post, we will focus on how to find users that do not have a Country set as part of their Office 365 Profile. The Country can be very useful for international company with more advanced people directories. It can also allow admins to create reports, or do changes by keying on this property. Next up, we will create an empty array in which we will later store our users without a country. Now that we have all our information, we will loop trough each user, and find out if they have anything in the Country property of their Azure AD user profile. If not, we will add our user to the array! 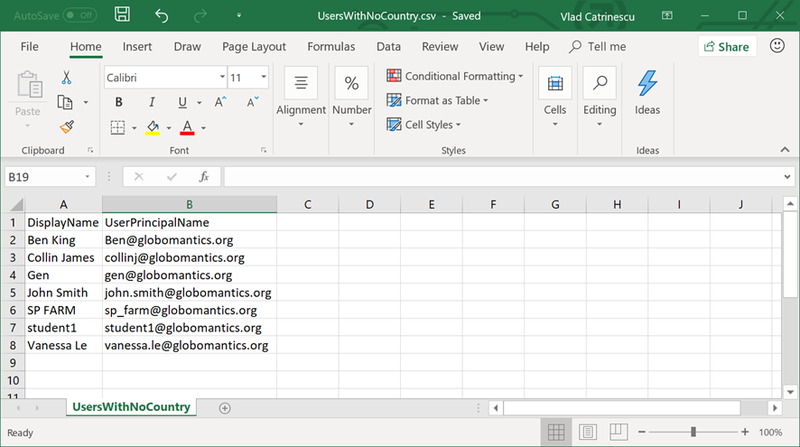 The final result is a CSV file in which we can see the display names and user names of all of the users in our tenant that don’t have the country in their profile! You can either contact them individually, or even Send Email from PowerShell in Office 365 in order to automatically send them a nicely formatted HTML e-mail asking them to fill it! 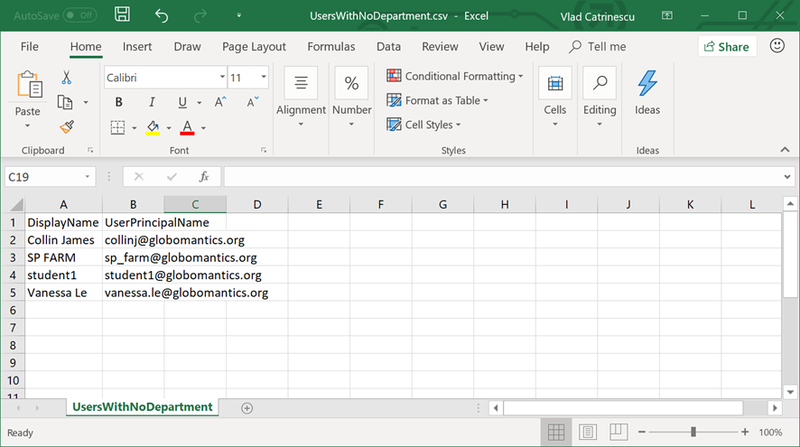 In this blog post, we will focus on how to find users that do not have a manager set as part of their Office 365 Profile. The Manager property is absolutely needed for features such as the Organization Chart, approvals in Microsoft Flow, quick team-calendar view and other productivity features in Office 365. Next up, we will create an empty array in which we will later store our users without a manager. Now that we have all our information, we will loop trough each user, and find out if they have a manager or not set as part of their Azure AD user profile. If not, we will add our user to the array! 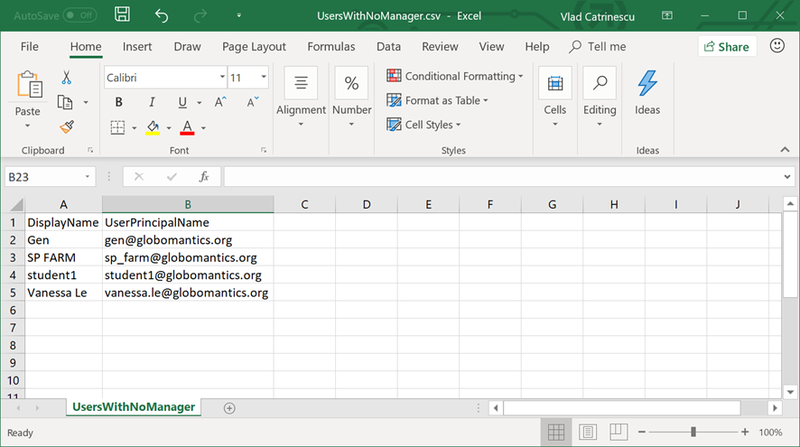 The final result is a CSV file in which we can see the display names and user names of all of the users in our tenant that don’t have a manager in their profile! You can either contact them individually, or even Send Email from PowerShell in Office 365 in order to automatically send them a nicely formatted HTML e-mail asking them to fill it! Next up, we will create an empty array in which we will later store our users without any skills . Now that we have all our information, we will loop trough each user, and find out if they have a SharePoint Online Profile or not (since the skills are stored in the SPO profile, not in Azure AD). If the profile exists, and the SPS-Skills property is equal to an empty string, it means the skills for this user are not set, so we will save the user object in the array we created in the previous step! The final result is a CSV file in which we can see the display names and user names of all of the users in our tenant that don’t have any skills in their profile! You can either contact them individually, or even Send Email from PowerShell in Office 365 in order to automatically send them a nicely formatted HTML e-mail asking them to fill it! In this blog post, we will focus on how to find users that did not set their picture as part of their Office 365 profile. With remote work becoming more and more popular and with teams spread across the board, it’s important to be able to put a face on a name. Multiple Office 365 experiences such as Teams, Delve, SharePoint leverage that profile picture in order to make the tools you use look a lot better, and quickly identify people inside the company. Without pictures, all of those experiences will only show gray placeholders, which is not optimal. First thing we are going to do is get our Office 365 credentials, and connect to both Azure Active Directory and Exchange Online! Next up, we will create an empty array in which we will later store our users without a picture. Now that we have all our information, we will loop trough each user, and find out if they have a picture as part of their profile. If not, we will add that user object to the array we have created earlier! The final result is a CSV file in which we can see the display names and user names of all of the users in our tenant that don’t have a picture set in their profile! You can either contact them individually, or even Send Email from PowerShell in Office 365 in order to automatically send them a nicely formatted HTML e-mail asking them to fill it! Next up, we will create an empty array in which we will later store our users without past projects. Now that we have all our information, we will loop trough each user, and find out if they have a SharePoint Online Profile or not (since the past projects are stored in the SPO profile, not in Azure AD). If the profile exists, and the SPS-PastProjects property is equal to an empty string, it means that there are no Past projects for this user, so we will save the user object in the array we created in the previous step! 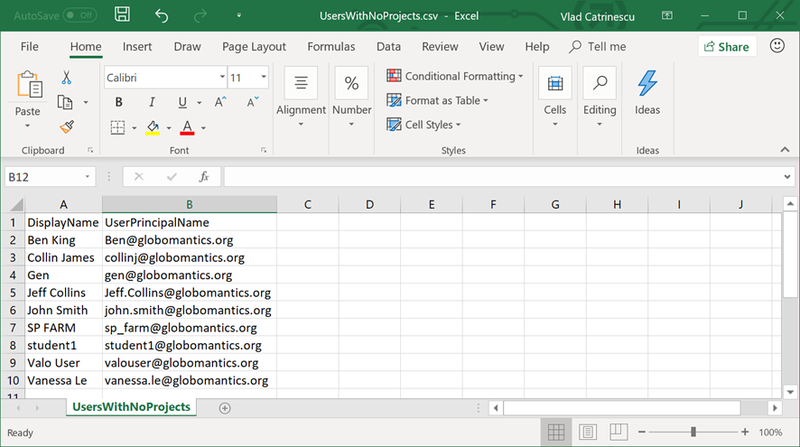 The final result is a CSV file in which we can see the display names and user names of all of the users in our tenant that don’t have their past projects set in their profile! You can either contact them individually, or even Send Email from PowerShell in Office 365 in order to automatically send them a nicely formatted HTML e-mail asking them to fill it! The cell phone is one of the trickiest properties to follow up on in Office 365. One of the main reasons is that the cell-phone is stored inside the user’s Azure AD profile. The SharePoint Online user profile also has a cell phone user property, and they are not synchronized together. This means that even if you see a user’s mobile phone inside Azure AD, you will see it everywhere in Office 365, except SharePoint Online and Delve. Since we have two places to check, with users that might have their mobile phone in one, but not the other, we will start checking their Azure AD profile! I will create an empty array, in which we will store all of the users without a cellphone set! We will then loop trouch each user, and check if their Mobile property is set or not. If not, we will add them to the array, and export them to a CSV file called UsersWithNoCellInAD.csv! With the AD done, we need to do a very similar thing , but for SharePoint Online! We will loop trough each user, and find out if they have a SharePoint Online Profile or not. If the profile exists, and the CellPhone property is equal to an empty string, it means the cell phone for this user is not set in SharePoint Online , so we will save the user object in a new array for SharePoint only reporting. 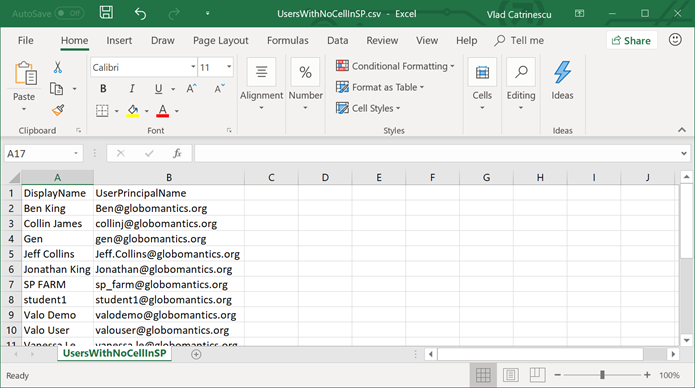 Lastly, we will export the results of the SharePoint results to a CSV file as well! 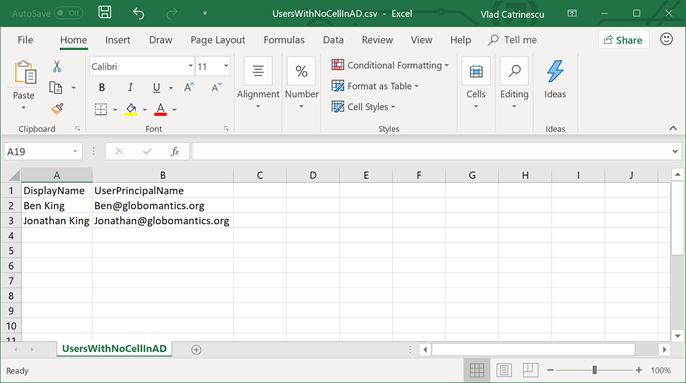 The final result is two CSV files, (one for Azure AD and one for SharePoint) in which we can see the display names and user names of all of the users in our tenant that don’t have a cell phone in their profile! You can either contact them individually, or even Send Email from PowerShell in Office 365 in order to automatically send them a nicely formatted HTML e-mail asking them to fill it! 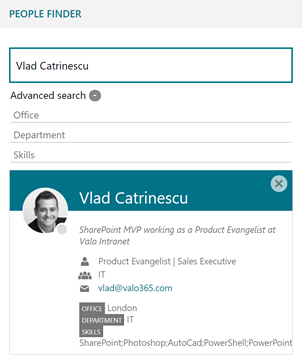 In this blog post, we will focus on how to find users that did not set their About Me as part of their SharePoint Online profile. The About Me is not usually a required property, but can increase the value and efficiency of a User Profile Directory inside your organization. Next up, we will create an empty array in which we will later store our users without an About me. Now that we have all our information, we will loop trough each user, and find out if they have a SharePoint Online Profile or not (since the About Me is stored in the SPO profile, not in Azure AD). If the profile exists, and the AboutMe property is equal to an empty string, it means the About Me for this user is not set, so we will save the user object in the array we created in the previous step! 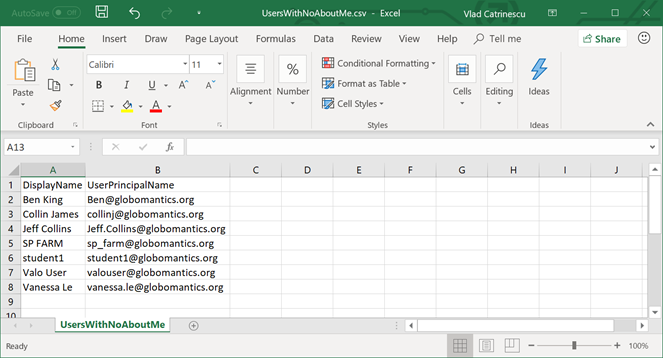 The final result is a CSV file in which we can see the display names and user names of all of the users in our tenant that don’t have their About me in their profile! 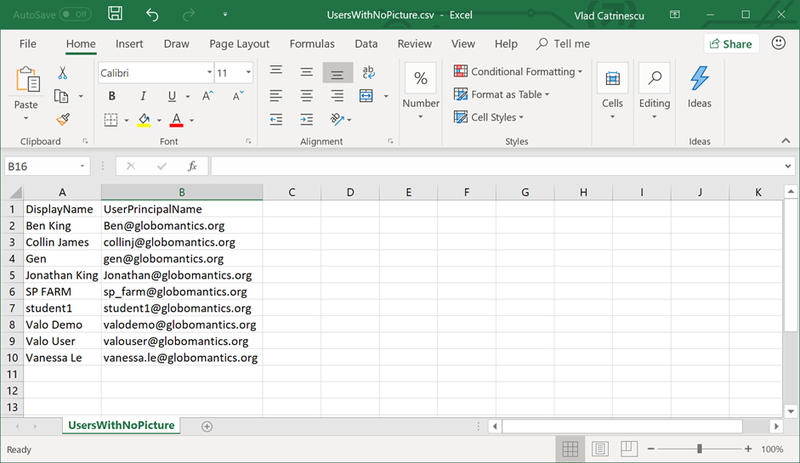 You can either contact them individually, or even Send Email from PowerShell in Office 365 in order to automatically send them a nicely formatted HTML e-mail asking them to fill it!